As we near the culmination of the SM Idol 3 Challenge on August 29 at the Makati Parks & Gardens, it is time to reveal Idol Cookie's choice as Idol Pick of the Week for Round 6. Cookie "was captivated by Lee's page this time. I love the over all look of her page, how she made her photo blend to the vintagey look of the layout. I also love looking at the detailed clustering of embellies near her photo. And my favorite is how she did her hidden journaling. 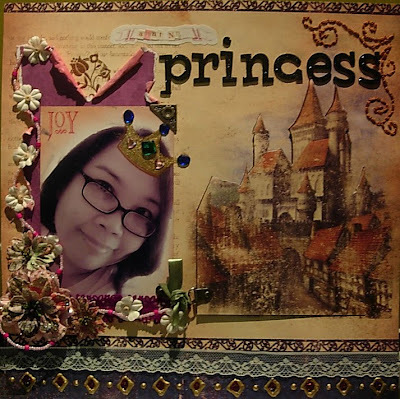 Love how that castle unfolds with the image still on the paper to reveal her beautiful and well expressed journaling. So gorgeous!!!! Congratulations Lee!!!" And Idol Cookie cheers on the Top 10 finalists. "Congrats to the top 10 too!!! Goodluck sa finals!!!" See you all on August 29 at the SM Idol Finals! I told you, Lee! Ikaw lang ang hindi bilib sa sarili mo e! I was so surprised when Alby texted me. Ganun pala ang feeling ng maging POTW. Thanks, Cookie. Now pwede na akong mag-retire from Idol. Hahaha. pero kidding aside. really love this!!! congrats again!!! congrats Lee! ang gorgeous naman talaga e!